Meet 5FDP and help struggling Musicians! Auction Ends Thursday! Here’s your chance to meet the guys from Five Finger Death Punch and help musicians in need! Sweet Relief Musicians is auctioning off a chance to meet the guys at an upcoming Trespass America Festival show this summer! The auction ends Thursday so, here’s your last chance! A special message from Chester Bennington Williams Ford III about the upcoming Trespass America Festival with Five Finger Death Punch, Killswitch Engage, Trivium, Emmure, Pop Evil, God Forbid and Battlecross….hide your kids! 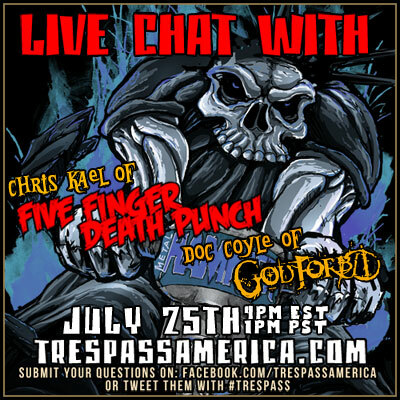 Live Chat with 5FDP and Pop Evil THIS THURSDAY! Trespass fans! We’re gearing up for another live chat! 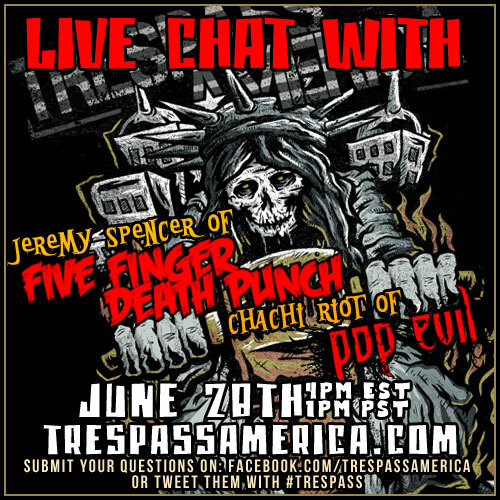 This time, you’ll be chatting live with Jeremy Spencer from Five Finger Death Punch and Chachi Riot from Pop Evil right here Thursday, June 28 at 4PM EST/1PM PST! Submit your questions on our Facebook Page or via Twitter with the #TrespassAmerica! 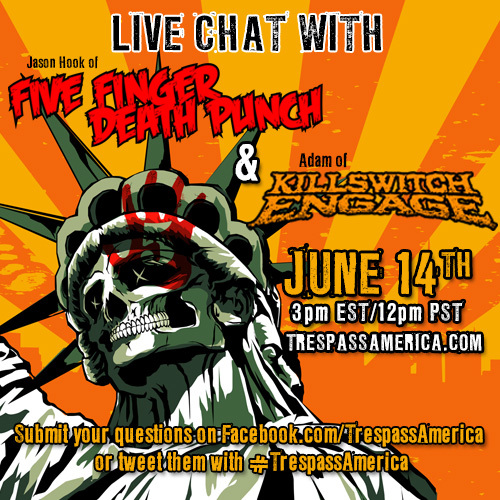 Live Chat with 5FDP and Killswitch Engage THIS THURSDAY! Trespass fans! We’re hosting a live chat with Jason Hook from Five Finger Death Punch and Adam Dutkiewicz from Killswitch Engage right here Thursday, June 14 at 3PM EST/12PM PST! Submit your questions on our Facebook Page or via Twitter with the #TrespassAmerica!